Round 5 of the League has commenced. Team, 'Poisoned Spud Variation' has emerged as the sole leader while winning each of their 4 rounds. LoneWolf Season 10 has ended. Here is a survey for all the members to provide feedback of their experience of the same. The survey also helps in deciding the community preference of when the next season should start. We urge all our readers to take two minutes and provide valuable feedback to the moderators. Rapid Battle #2 has just begun with 32 participants, of which 11 are above lichess rating of 2000. You can late-join up to June 11, but late-joining makes your chances of winning more difficult since you'd automatically be placed in a lower bracket (also you get less games). Each round requires two games (one as white, one as black, with starting colours up to the participants) to be played. Thanks to everyone who participated in Season 2 of Series. Registration for the next edition should begin from 28th May, 2018. Season 3 Should probably begin by 11th June, 2018. For more info on Season 2, click here. 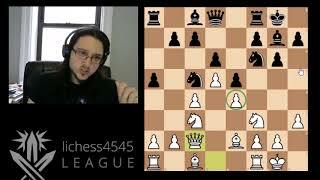 For more info on Chess Series, please join #series-general on slack. 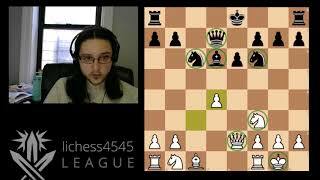 Two comprehensive video reviews by @quirked of the nominated games from last season of 4545 League. Stay tuned to the CLTV Youtube page for VODs and streams. Please note, stats of the league Round 5 in issue no. 054 were not correct. We have corrected them and apologize for the mistake. The fastest mate was white on move 16 found in Gamelink White: isaypotato, Black: lynnpv. The fastest draw was on move 18 found in Gamelink White: moistvonlipwig, Black: camelclutcher. The fastest resign was white on move 11 found in Gamelink White: pgsankar, Black: arbisto. The biggest upset was 272 points in Gamelink White: acer30, Black: upgoerfive. The longest game ended with black on move 82 Gamelink White: jrvdwjr, Black: scarff. 152 was the highest ACPL in Gamelink White: gusish, Black: cammusbread. 4 was the lowest ACPL in Gamelink White: flokithecat, Black: lovlas. Combined maximum ACPL was 281 in Gamelink White: gusish, Black: cammusbread. Combined minimum ACPL was 8 in Gamelink White: flokithecat, Black: lovlas. The longest think was 30 minutes 52.0 seconds by 26 in Gamelink White: morallygray, Black: unlimitedattack. The most time left was 67 minutes 27.0 seconds in Gamelink White: finessemax, Black: nivenn. The most time spent was 91 minutes 29.0 seconds in Gamelink White: ahmt92, Black: d3doubleexclam. The fastest mate was white on move 13 found in Gamelink White: forhavu, Black: simon-w, Gamelink White: aplause, Black: amanlikekennyken. The fastest draw was on move 18 found in Gamelink White: rgpchesspe, Black: fairytaletime. The fastest resign was black on move 7 found in Gamelink White: caxmati, Black: cabbageattack. The biggest upset was 408 points in Gamelink White: mn8, Black: giulio451. The longest game ended with black on move 104 Gamelink White: rampichino, Black: lenguyenthanh. 169 was the highest ACPL in Gamelink White: jjplayz, Black: bluebearchess. 4 was the lowest ACPL in Gamelink White: vgd123, Black: giulio451. Combined maximum ACPL was 307 in Gamelink White: dalejos, Black: doctodoom. Combined minimum ACPL was 9 in Gamelink White: vgd123, Black: giulio451. The longest think was 18 minutes 12.0 seconds by 20 in Gamelink White: journey_to_nm, Black: sreejith993. The most time left was 48 minutes 22.0 seconds in Gamelink White: geoffjo, Black: pedropablo72. The most time spent was 81 minutes 30.0 seconds in Gamelink White: rampichino, Black: lenguyenthanh. Accuracy King: with an average of 19 ACPL in 10 rounds played, rgpchesspe. Fast Finisher: with an average gamelength of 45 ply/23 moves in 11 rounds played, caxmati. Marathon Man: with an average gamelength of 112ply/56 moves in 9 rounds played, rampichino. 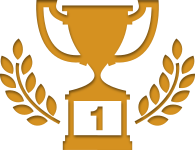 Giri Award: 5 draws in 10 rounds played, tonychess75. Biggest rating gain: with 152rating points, gokuba. Biggest rating loss: with 88 rating points, rampichino. The fastest mate was black on move 25 found in Gamelink White: journey_to_nm, Black: moistvonlipwig. The fastest draw was on move 37 found in Gamelink White: tomek188, Black: f1nn33. The fastest resign was black on move 11 found in Gamelink White: kobol, Black: outerheaven92. The biggest upset was 7 points in Gamelink White: journey_to_nm, Black: moistvonlipwig. The longest game ended with black on move 54 Gamelink White: colwem, Black: rodrigodiazdevivar. 81 was the highest ACPL in Gamelink White: journey_to_nm, Black: moistvonlipwig. 10 was the lowest ACPL in Gamelink White: kobol, Black: outerheaven92. Combined maximum ACPL was 121 in Gamelink White: journey_to_nm, Black: moistvonlipwig. Combined minimum ACPL was 44 in Gamelink White: tomek188, Black: f1nn33. The longest think was 18 minutes 21.0 seconds by 27 in Gamelink White: moistvonlipwig, Black: assassin_in_white. The most time left was 90 minutes 13.0 seconds in Gamelink White: kobol, Black: outerheaven92. The most time spent was 112 minutes 53.0 seconds in Gamelink White: colwem, Black: rodrigodiazdevivar. Click on the images for the solution. Chessboard images provided by lenik terenin. Please feel free to join #lichessledger on slack if you would like to contribute towards the ledger in any way, or provide any feedback. Both are highly encouraged and appreciated. Thank you for reading. Thanks to @forhavu, @kraaft, @luvgangster, @quirked, @somethingpretentious and @spiteknight.